Angel Wing begonia (Corallina de lucerna) is primarily grown for its elegant foliage. Unlike many begonias, this particular variety needs plenty of bright but indirect light to thrive. The key to getting this plant to bloom and thrive is providing the proper care and environment. The Angel Wing begonia is so named because of its graceful angel-like foliage. This plant grows like a cane, 2 to 3 feet in height. It requires some sun to partial shade, blooms all year round, and attracts bees and butterflies. Angel wings require slightly acidic soil and can be propagated by cuttings. Plant Angel Wing in well-drained, slightly acidic soil which has a pH of 6.5. Use a pH meter to check your soil. As of October 2009 a pH meter can be bought at the local nursery for around $5. Place Angel Wing in a spot that receives up to 4 hours of sunlight a day. A southern exposure is ideal for this plant. Water this plant moderately allowing the top inch of soil to dry out. Place moist stones or pebbles at the base of the plant to increase the humidity of the plant. This plant requires the extra moisture in the air to keep it healthy and to make it bloom. 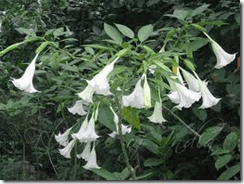 Fertilize this plant every two weeks when not in bloom with a non-lime liquid fertilizer. Prune away older canes by cut ting them at the base of the plant to promote blooms and new growth. In the winter time this plant likes temperatures between 70 to 72 degrees. During the winter this plant will tend to go dormant if left in low lighting conditions therefore to keep it thriving supplement the light if you live in an area where lighting is poor during the winter.